About the topic "Graphing rational functions"
"Graphing rational functions" is the stuff being searched by almost all the students who study math in high schools. To make the students to understand "How to graph rational functions", we have given step by step explanation. Before learning "How to graph rational functions ? ", first you have to be knowing the following stuff. To know more about the above mentioned stuff, please click the topics given above. If you had already learned the above mentioned stuff, then you are ready to learn the stuff, "How to graph rational functions". Now let us take an example and understand graphing rational functions. Graph the rational function given below. First, we have to find hole, if any. To find hole of the rational function, we have to see whether there is any common factor found at both numerator and denominator. In our problem, clearly there is no common factor found at both numerator and denominator.So, there is no hole. Now, we have to find vertical asymptote, if any. 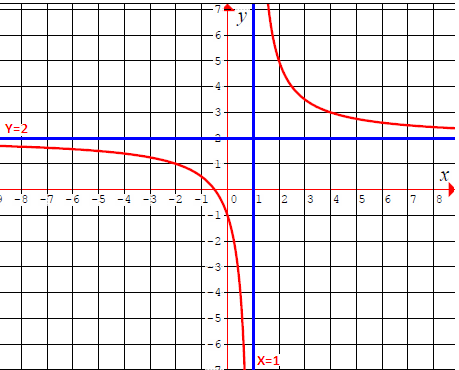 Most of the rational function will have vertical asymptote. To find vertical asymptote, we have to make the denominator equal to zero. Now we have to find horizontal asymptote, if any. In the rational function given above, the highest exponent of the numerator and denominator are equal. So there is an horizontal asymptote. 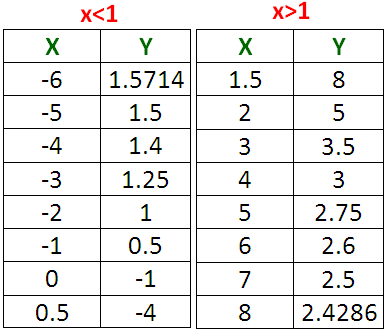 Here "a" and "b" are the coefficients of highest exponent terms at the numerator and denominator respectively. Now we have to find slant asymptote, if any. Since there is horizontal asymptote, there is no slant asymptote. In the given rational function, now we have to plug some random values for "x" and find the corresponding values of "y". We have already known that the vertical asymptote is x = 1. That is, x<1 and x>1 but not x=1. For more problems and solutions on graphing rational functions, please click the below links.